This is a label on the post of an iron railing in front of 70 Middagh St., Brooklyn. 19th century New York iron founders produced thousands of such railings (it was a mainstay of their business), but this is the only instance I have found where the foundry name is identified. 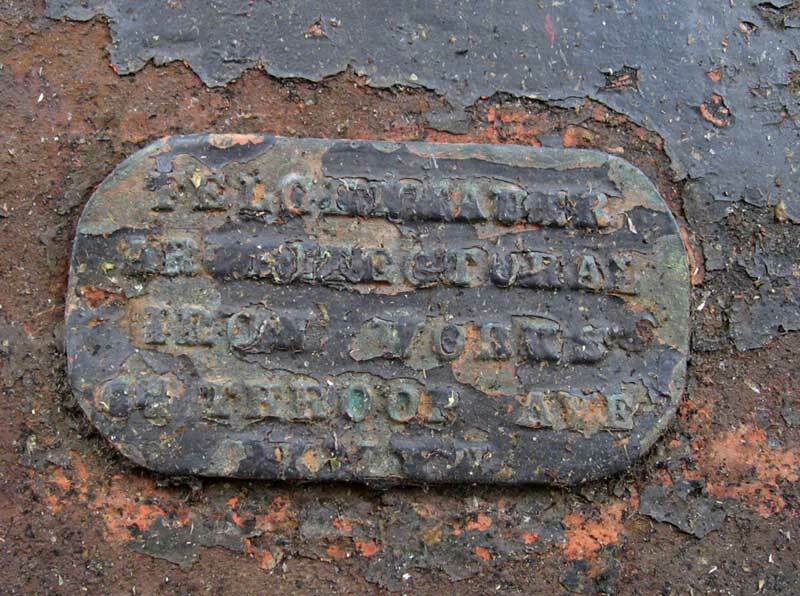 The label is difficult to read and the post behind the label is rusting, but this is a rare example of a foundry identifying itself on a railing. The Felgenhauer Architectural Iron Works was founded by Edmund Felgenhauer (1843-1902) approximately 1875. Felgenhauer was a native of Austria, and immigrated to the U. S. in 1866. He appeared in U. S. Census reports in 1870, 1880 and 1900. In 1870 he was a blacksmith living in Huntington, Suffolk County, New York. His name in that census was spelled Feldenhaar. His wife, Antonia, seems to be spelled Anthony, and he had two children, Edmund Jr., 3, and Amelia, age 1. Felgenhauer appeared in Brooklyn city directories in 1875 as "hinges" at 39 Gerry St. By 1877 he was a blacksmith, in business on Throop Ave., Brooklyn. In the 1880 U. S. Census he was recorded as "Fredrick Felghauer" and he lived at 43 Throop Ave., Brooklyn. He was a blacksmith, age 36, born Germany. In addition to his wife, Antonia, the family consisted of seven children. The oldest was Edward, age 12, born Germany. The other children were born in New York. The youngest was Charles, four months old, born Jan. 1880. In the 1880 census for industries (non-population schedules) E. Felgenhauer was described as "Builders Hardware." They owned $1500 capital and materials valued at $1350. They employed as many as three workmen and paid $2.00 for a day's work, which consisted of ten hours. The annual wages amounted to $400, and the value of the preceding year's production was $2358. These are extremely modest numbers compared to other iron foundries of the time that employed hundreds of workmen and sold upwards of $100,000. Edmund Felgenhauer had two sons who followed him in the business. Their names were confusedly similar: Edmund Felgenhauer, Jr. (1867-1937) and Edward Felgenhauer (1872-?). The business became E. Felgenhauer & Son around 1894, and moved from Throop Ave. to Lexington Ave., Brooklyn, around 1900. Edmund Felgenhauer died 14 June 1902, and E. Felgenhauer & Son in 1904 consisted of three of his sons, Edmund, Edward T. and John F. Felgenhauer. A fourth son, Frank J. Felgenhauer, was also involved in the business by the time they moved to 796 Wythe Ave. (approximately 1906). The last listing for this business in Brooklyn city directories was 1913. By 1920 Edmund Felgenhauer Jr. had changed his name to Edmund Fellows. He appeared under this name in the 1920 and 1930 U. S. Census reports. In 1920 Edmund Fellows was employed in "Iron Work Construction." In 1930 perhaps the Depression had hit hard; he was a "Laborer, Highway Dept."